After some stops and starts, at last the federal government has released the long-awaited proposal for Stage 2 of qualifying for the meaningful use of electronic health records incentives. In a 455-page proposal released Feb. 23, the Centers for Medicare and Medicaid Services has laid out the details for how it will raise the bar for healthcare providers to qualify for incentives. Among its provisions, CMS will delay the start of Stage 2 until 2014 instead of 2013. As expected, the next stage of meaningful use builds on the criteria of the first stage, including increasing the threshold for performance of existing measures and pushing providers to actually exchange information in various transactions to drive continuous quality improvement. In Stage 2, CMS said it would keep the same core-menu structure for required measures. Physicians will meet 17 core objectives and three of five menu options. Hospitals will meet 16 core measures and two of four menu options. Health information exchange will be ramped up to a more “robust transitions of care” core objective, and the measure to provide patients with an electronic copy of their data is replaced by “electronic/online access” as a requirement. The proposed rule had been widely expected sooner, and agency senior leaders faced disappointed crowds the day before at HIMSS12 without a rule in hand but gave them a “sneak peek” summary of the objectives. The public will be able to comment on the 455-page proposed rule for 60 days after which CMS will finalize the regulation during the summer. CMS decided to delay the onset of Stage 2 by one year to 2014 because the original 2013 timeframe does not give vendors enough time to design, develop and test new functionality and providers to deploy it and track measures over the one-year reporting period. As a result, Stage 1 is extended until 2014. 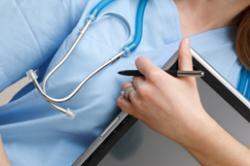 CMS is also trying to make the reporting of quality measures in 2014 easier for providers. For physicians, the clinical quality measures will align with existing quality programs, such as those used for the Physician quality Reporting System and CMS’ Shared Savings Program. For hospitals, the clinical quality measure will line up with the Hospital Inpatient Quality Reporting and the Joint Commission’s hospital quality measures. Physicians will report 12 clinical quality measures, while hospitals 24. The agency also outlines how providers may electronically submit the quality measures, and. CMS wants public feedback on methods for it, including aggregate-level and group reporting options and through existing quality reporting systems. Conduct or review security risk analysis, address encryption or security of data at rest and execute security updates as necessary and correct identified security deficiencies. A copy of the proposal can be found here.